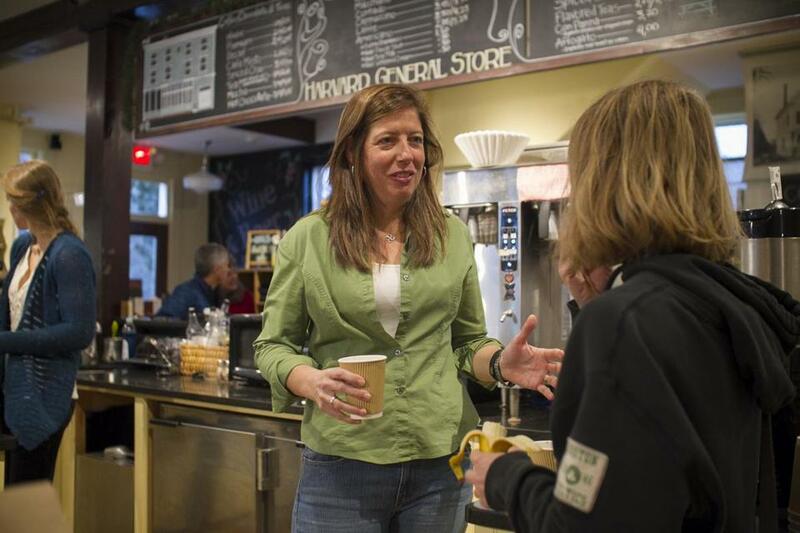 At Harvard General Store, conversation’s a staple. Manager Carin Klem (above) chatted with Mindy Atwood. HARVARD — The morning is just getting underway, and Harvard General Store is buzzing with activity. Commuters trickle in to grab coffee and muffins to fortify themselves for the drive to work; a group of older men sit around a table, swapping stories, glancing at the newspapers, and arguing politics; and friends are running into each other, spending a few minutes to catch up. Variations of these scenes will be repeated throughout the day in this clean, bright storefront, capturing the daily rhythms of a small town: stay-at-home moms meeting for lunch, teens hanging out after school, and tired commuters picking up six-packs of beer and prepared meals after long days at work. In the three years since Scott Hayward took over the store — the only retail establishment in this town of about 6,500 — it has been more than just a business, attracting activity to the town center, bringing neighbors together, and adding to the fabric of the community. But Hayward doesn’t know how long he can continue because a small customer base, low volume, and high costs are making it difficult to squeeze out any profit. In the three years he’s owned the store, he’s done no better than break even. Harvard and the General, as it’s known here, face the same challenges — and the same decisions — confronting many small New England communities where residents hunger for the social connections and conveniences that country stores bring, but where populations are too small and profits too elusive to sustain certain businesses. As a result, some are trying new ways to keep these business going. 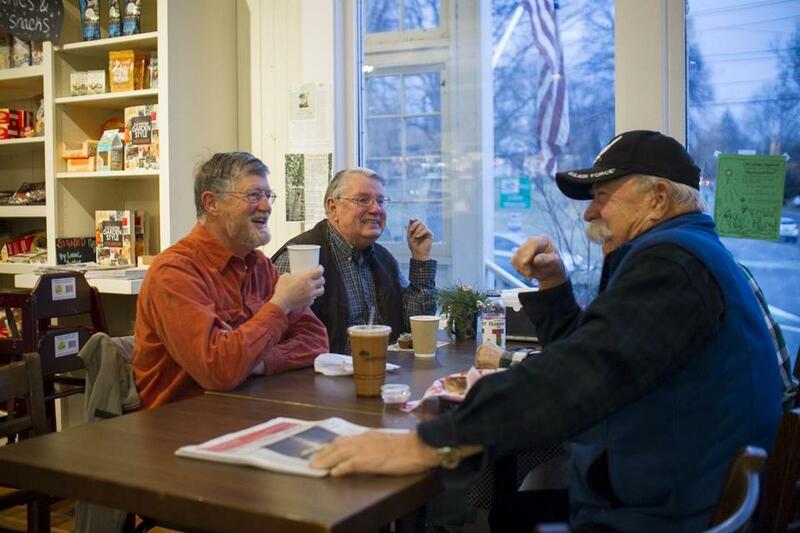 Friends from left Tom Garfield, Peter Warren and Nelson Northern, all of Harvard, laughed while chatting over a cup of coffee inside the Harvard General Store. In Petersham, a town of about 1,200 near Quabbin Reservoir, the East Quabbin Land Trust, a nonprofit that preserves open spaces, buildings, and historic farms, raised $320,000 and bought the 1840 Greek Revival building that houses the Petersham Country Store in 2013. The trust rents the first floor to the store’s owner but pays for maintenance costs — such as heat, water, and upkeep — that would otherwise make operating the business untenable. Pugliese and his wife, Jeanneane, have operated the store since 2014, offering a cafe, prepared meals, and a market that sells local foods and gift items, as well as cozy venue where the locals share conversations from tables set close together. In Vermont, at least 10 towns have followed a similar model to bring in country stores and cafes. In Peacham, a town of about 750 in the state’s Northeast Kingdom, the nonprofit Peacham Community Housing purchased a vacant bus barn from the town for $1 and partnered with Peacham LLC, a volunteer group, to raise money to restore, maintain, and manage the building. The tenant, the Peacham Cafe, pays a reduced rent, about two-thirds of the estimated market value. The rent will rise as the cafe’s profits do. In Harvard, residents may need to take similar steps to save the General. The building, constructed in 1816, has housed an array of businesses, including a book store and bindery, a real estate office, and a series of general stores — in between the years when the building was vacant. Hayward, 65, an architect and former real estate development manager, bought the business in 2012. A new hookup to the town’s sewer system meant he could add a restaurant to the store, which, along with other changes, gave him a chance to make the business viable, he said. The General, bright and open with polished floors, offers prepared foods, such as vegetable lasagne, spicy red curry chicken, and chicken pot pie, as well as a variety of wines, cheeses, and specialty items. Hayward said customers may pay higher prices than at the supermarket, but he hopes they consider the intangibles their purchases support. Nelson Northern, 84, has lived in town for 40 years and stops at the general store three or four times a week. On Tuesday mornings, he meets a group of retired friends for coffee. “It’s a place that’s always been a gathering place; it’s gone through a lot of iterations,” said Northern, who tries to buy his staples — bread, milk, cream — at the General. Hayward has taken creative approaches to increase the revenue. Every Friday, in the finished second-floor hall above the General, he holds “Pub Night,” which includes dinner and entertainment by various local bands. On Saturdays, the store hosts a farmers market, another way to attract customers. 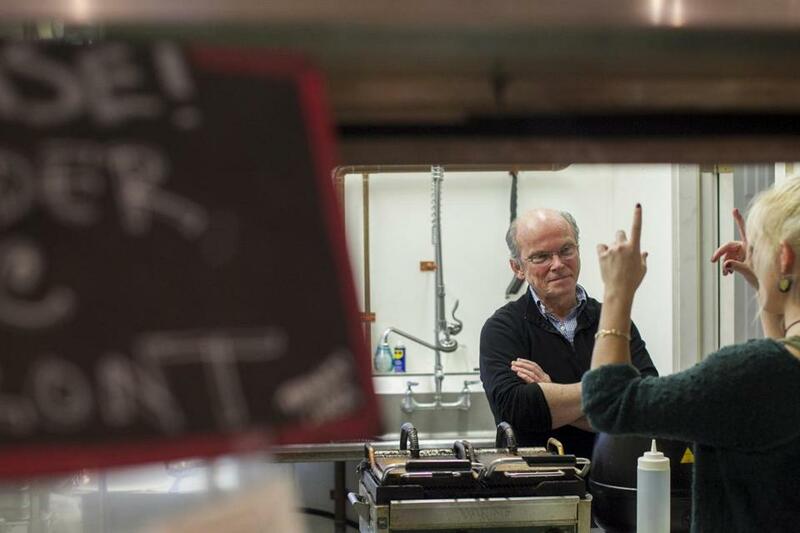 Harvard General Store owner Scott Hayward (left) chatted with line cook Meg McCann inside the store's kitchen. But Frederick said the trust is unlikely to follow similar organizations that have bought properties and helped with the expenses to support country stores. Frederick said the group’s experience with managing an affordable housing project, and the costs that it incurred, convinced it to stick to preserving open space. Hayward said he doesn’t know how much longer he’ll keep going. His lease runs out in June, and he’s not sure he’ll renew it. He said he needs the community’s support, starting with more people patronizing his business. So for the time being, Hayward is on his own. Al Combs, 67, a real estate developer and equestrian school operator who has lived in Harvard for 20 years, often stops at the store for coffee. As much as he appreciates the convenience and the chance to meet friends, the only solution he sees for the General is to attract more customers. “Scott did not have to do this,” Combs said.